How Should Floyd Mayweather Jr Be Remembered? On the verge of Floyd Mayweather Jr’s final fight on September 12 I’ve been debating with myself over just how his ironclad first ballot Hall of fame career should be remembered and how high up upon the pantheon of all time greats does the self proclaimed “T.B.E.” or “The best ever” deserve to be placed. Let’s start out by simply stating that no one with even a casual knowledge of the sport to the most ardent historian of the sweet science can deny Mayweather’s greatness. He’s 25-0 in recognized world title contests. He’s beaten two men in Oscar De LA Hoya and the late ‘ultimate blood and guts warrior’ Arturo Gatti who have already been enshrined in the hallowed halls of Canastota New York and at least a hand full of other men who will surely be enshrined in the International Boxing Hall of Fame when they come up on the ballot. Floyd has also beaten a plethora of ring proven men who already appear on the prized IBHOF ballot -such as the late Genaro Hernandez who he soundly defeated for his first major World title back in 1998- or men such as Saul Alvarez, Jose Luis Castillo, Ricky Hatton and the late former lineal light weight champion Diego Corrales, who will more than likely be selected for admission onto the ibhof ballot for future hall of fame voters to consider for enshrinement into boxing’s most prestigious of circles. Also in favor of Floyd’s at least once-in-a-generation greatness is the fact that he is a stunning 11-0 against lineal world champions, men who beat the men to win that ultimate prize that all pugs dream of one day doing. And with the exception of a game, gritty and determined De LA Hoya and perhaps a body bludgeoning barrage withstood at the hands of the once great Jose Luis Castillo (a close fight which Floyd later avenged and left no doubt about the second time around), Floyd easily beat the lineal titilists of his generation in a run of greatness from 130 to 154 lbs. The only slight bit of criticism I can glean from Floyd’s flawless record is that it often seems as if Floyd has waited until the absolute right time to fight men such as De LA Hoya, Mosely, Cotto or most namely and most recently fellow all time great Manny Pacquiao when the list of aforementioned certain first ballot hall of famers were slightly past their primes. Although these respective afforementioned challengers to Floyd’s unblemished record were certainly still game opposition, I feel as if Floyd waited until these fine pugilistic powerhouses were a little less of a challenge to defeat at that particular time in their respective careers. Floyd simply waited for just the right time for each of his big named opponents to slow down skillwise to his liking, but also still have enough credibility with fans of the sport as both superstar names and skilled opponents who he could also reap prolific financial profits from fighting. That is why love or loathe him he is still undefeated and the Sports highest earning athlete of all time heading into his final fight. Would Floyd still be undefeated if like fellow legend Bernard Hopkins he chose to face younger, more dangerously primed opposition? At this point the closest answer we have to that question that will now never be definitively answered is found in his 2013 showdown with a slightly green Saul “Canelo” Alvarez in which Floyd easily won, providing Alvarez (just barely 23 at that time) a master lesson in the finer points of pugilism. With all of that said, with all of the great men Floyd has beaten, when he has chosen to take them on and for all the controversy and money he has made, when I sit back and watch tape of him I see an undeniably great fighter, blessed with reach, reflexes and an uncanny adroitness of hand and mind that sets him apart as perhaps his generations greatest. I see skills and attributes in Floyd’s game that would make him a great prize fighter in any era and the only real criticism I can bring against his legacy is, as stated in detail earlier, he has seemingly avoided the bigger names he defeated on his resume while they were in their absolute primes. And that’s a shame really, a shame that many fight fans will always ask “What if?” What if Floyd, who is undeniably as great a fighter this generation has seen skillwise had simply chosen to challenge himself more as concerning opposition faced. Mayweather at 38, (48-0 26 KO) who is currently set to take on a fighter in Andre Berto 31, (30-3 23 KO) who he is expected to defeat in style as a sort of “victory lap” for his Hall of fame career probably hasn’t truly been tested in the ring by a prime opponent since 2007, when he defeated the then unbeaten Ricky Hatton. Answering the question of where Floyd Mayweather Jr. Ranks amongst the all time greats is almost as tricky and perplexing as his in ring style, and it is one that will be ardently debated amongst fans of the sweet science for many years to come. 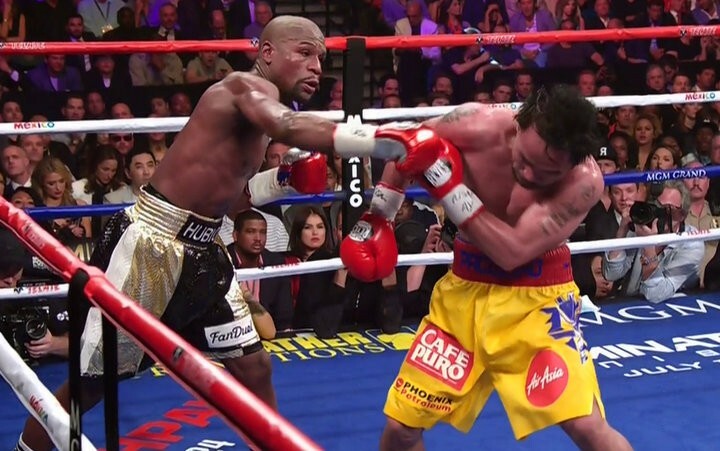 You are here: Home / Boxing News / How Should Floyd Mayweather Jr Be Remembered?